LLM Family Law is a 2-year post-graduate program. Candidates who wish to seek admission to this course must hold a Bachelor’s degree in Law. Admission to this course will be granted based on the performance of candidates in the entrance exam conducted by the respective universities or colleges. The average fees to pursue LLM Family Law program from the universities mentioned above ranges between INR 55,000 and 4,00,000. Students who wants to get expertise in Family law and various cases related to family matters and having logical and analytical bent of mind are well suited for LLM in Family Laws course. This course is designed to help students in becoming a skilled family lawyer having a thorough knowledge regarding various matters related to a family such as a divorce, family violence, child custody, abuse, financial settlement and many other problems of a family. The career options in LLM Family Laws course includes employment in filed like Colleges and Universities, Law Courts, Law Firms, NGOs etc. After the completion of this course, students can get jobs in various profiles such as Magistrate, Lawyer, lecturer etc. 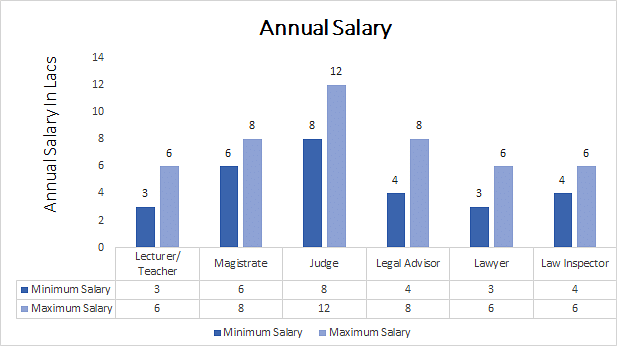 The average annual salary offered to students holding LLM degree in Family Laws ranges between INR 3,00,000 to 8,00,000 depending on candidate’s experience and level of knowledge. Top Recruiting Organizations High Court of India, Supreme Court of India, District Court, Block Offices, Family Planning Offices, Amity University etc. Top Recruiting Areas College and Universities, Law Courts, Law Firms, NGOs etc. Top Job Profiles Judge, Lawyer, Lecturer, Law Inspector etc. LLM Family Law: What is it about? LLM Family Law focuses on the topics related to family matters such as divorce, abuse, custody of children, financial matters etc. This course also concerns with areas related to tax, contracts, real estate, partnership law and many other fields. This course is suited for those students who are desirous of getting specialization in Family Laws and matters related to the family. Students who wish to seek admission to LLM in Family Laws should have skills like problem-solving abilities, analytical and logical thinking and they should also have an enthusiasm for doing something good for society. On completion of LLM Family Law course, students can go for jobs in various fields like district courts, NGOs, Law Firms, Govt. and Private Offices and Colleges/ Universities as a Judge, Lawyer, Law Inspector, Lecturer in Colleges or Universities etc. Students who wish to seek admission to LLM Family Law course must hold a Bachelor’s degree in Law (LLB) or equivalent from a recognized university. Candidates are required to clear the cut off percentage set by the college or university in the entrance test. Admission to LLM Family Law program will be granted strictly on the basis of student’s performance in Entrance Test conducted by the College/ University followed by Interview. Admission to this course will commence in the months of July-August. Candidates can fill the application form for admission to this course either online or offline. To fill the application form online, students have to visit the university’s/ college’s website and fill all the necessary details correctly in the application form. On successful registration, the university officials will contact you through your mobile phones or through email id provided by you at the time of registration. You are required to visit the college/ university in person with all the documents required such as Graduation Mark Sheet, Degree, ID proof, and Photographs. Candidates who wish to apply offline have to purchase the application form along with a brochure from the college campus and submit the same after filling the same correctly. The college/ university mentioned above releases its cut-off marks in the entrance exam for admission to LLM in Family Laws program. Admission will be offered strictly to those candidates who clear the cut-off marks decided by the respective colleges/ universities and meeting the other admission requirements decided by the admission authority. LLM Family Law course gives students a golden chance to move a step ahead in doing something good for people, for their country. This course is also beneficial for students as it provides advanced knowledge of legal rules and procedure in the field of Family Law and almost all problems related to a family. On completion of this course, various opportunities exist for students such as he/she could become a Law Inspector, Magistrate, Legal Advisor, Lawyer, Lecturer etc. One can also join Legal departments of Govt. of India and other State Governments. The average salary offered to students holding LLM degree in Family Laws ranges from INR 25,000 to INR 60,000 per month depending on the college, degree, and experience of the student. Students having experience in this field might get a job with a handsome salary. If you are looking for a powerful job profile for you along with high salary, then LLM (Family Laws) will be a perfect choice for you.